To all women with PCOS: I know your pain. I have felt it myself. But I hope that my story gives you hope. The post below gives you a summary of some of the things I did to improve my health and balance my hormones to maximize my fertility,but it’s not an exhaustive list (I’m not discussing supplements, acupuncture, meditation and other very efficient techniques in this post due to time constratins) and you should always work with a healthcare practitioner to individualize your treatment plan. In addition to causing irregularities in the menstrual cycle (irregular period or amenorrhea), PCOS can induce a whole host of symptoms from hirsutism, or an excessive hair growth, thinning scalp hair, acne, pelvic pain and weight gain or difficulty to lose weight. Eating disorders, especially binge eating disorders, and mental health problems, such as depression and anxiety, are also more common in women with PCOS. The frequent higher blood sugars, impaired blood cholesterol levels and elevated blood pressure also associated with PCOS increase the risk of developing type 2 diabetes and cardiovascular diseases. (1-3) PCOS needs to be taken seriously. The good news is that there is a lot you can do to improve your fertility, regulate your menstrual cycle and manage your PCOS symptoms… and it starts with what you put on your plate. The Paleo diet is the perfect template for the Paleo diet. If you need help to get started, join my next online REAL Food Challenge! Not all women with PCOS have the symptoms and not all cases of PCOS have the same root cause. However, for a majority of women with PCOS, not only those struggling with their weight but lean women as well, insulin resistance is to blame. Insulin resistance is a form of prediabetes and can disrupt your hormone balance. Insulin is a very important hormone required to keep your blood sugar levels in check. Your pancreas produces insulin in response to carbohydrates to prevent your blood sugar levels from rising too high and allow the extra sugar derived from carbohydrates to be taken from your blood into your cells to be stored as fat. Without enough insulin, your blood sugar levels would go sky high, as it does in untreated type 1 diabetics. The problem with women with PCOS dealing with insulin resistance is that their body becomes resistant to the action of insulin. The cells are supposed to “listen” to insulin when it says to do something about your blood sugar levels. With insulin resistance, it is like if your cells had become deaf and can’t hear insulin anymore. To try to make itself heard, the pancreas cranks up the music by producing more and more insulin. The hyperinsulinemia, or high insulin levels, associated with insulin resistance can affect your whole body, including your ovaries by triggering the production of more testosterone which affects your whole hormonal balance and lead to PCOS. Note: Although insulin resistance appears to be the most common root cause of PCOS, it is not the only one. PCOS Unlocked: The Manual by Stefani Ruper details the other main causes and what to do about it. I highly recommend it. 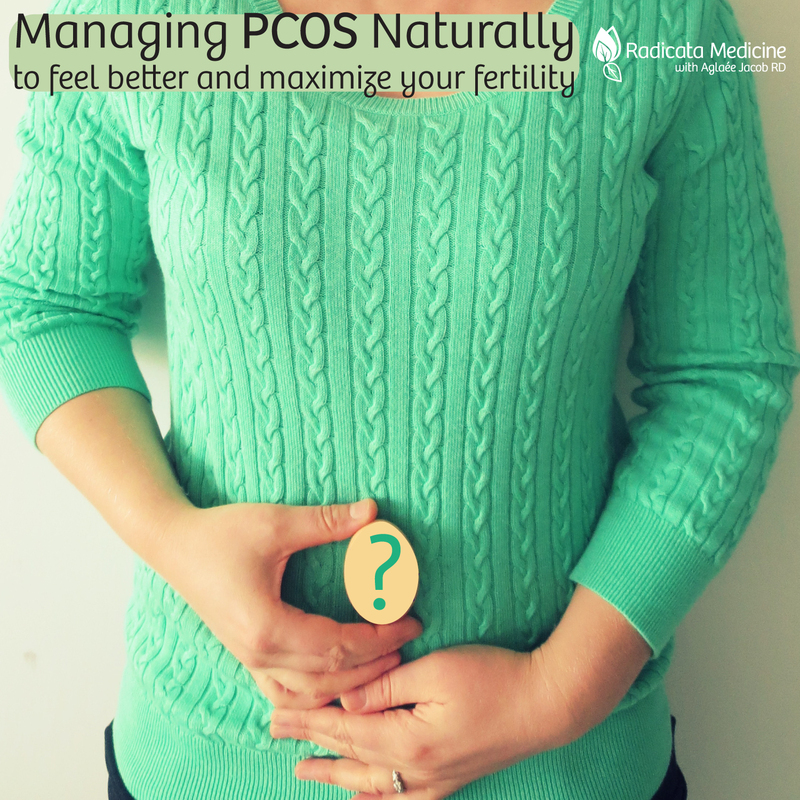 What Can You Do About Your PCOS? For most women with PCOS for which high insulin levels and insulin resistance are behind their hormonal imbalances, improving your health, PCOS symptoms and fertility start by managing your blood sugar levels. Taking care of your blood sugar levels will automatically help your insulin levels, insulin resistance and ultimately restore your natural hormonal balance. It is harder for most women with PCOS to achieve and maintain a healthier body weight both because of the high insulin levels and because of the strong cravings caused by the hormonal imbalances. Although no studies have looked specifically at the effects of the Paleo diet on PCOS yet, many anecdotal evidence from women successfully managing their PCOS with the Paleo diet indicates that this can be a promising option that is worth a try. What do you have to lose? If adopting the Paleo diet works for you, your periods will regularize, you will get rid of your love handles, eliminate most or all of your PCOS symptoms and become naturally more fertile. Many studies show that low-carb diets as well as the Paleo diet decrease hyperinsulinemia and insulin resistance, stabilize blood sugar levels and facilitate weight loss. It is not too much of a stretch to say that a low-carb version of the Paleo diet could be an effective option for women with PCOS. Women with PCOS definitely don’t do well with a low-fat, high-carb approach and it is agreed even in the mainstream that they should limit their carbohydrate intake and replace them with fat. (3) The extent to which carbohydrates need to be limited depends on many factors, including your weight, your degree of insulin resistance and blood sugar dysregulation, your physical activity level and personal metabolism, but even conventional dietitians agree that women with PCOS should definitely not have more than 40 percent of their calories in the form of carbohydrates. (3) Because the Paleo diet is based on real unprocessed foods, it is the best diet to follow to naturally lower your carb intake while increasing your fat intake. The Paleo diet is not necessarily a low-carb diet, but it is definitely lower in carbs compared to the standard American diet (see table below). The standard American diet can disrupt your hormones not only by destabilizing your blood sugar levels, but also by exposing you to many foods containing xenohormones. Xeno means foreign and xenohormones simply mean hormones that are not produced by your own body but introduced from your environment or food into your body. Dairy products and meat from conventionally-raised animals often contain added hormones that can make their way into your body. Pesticide residues on fruits and vegetables are known to be endocrine disruptors, a term that simply means that they lead to hormonal imbalances. The phytoestrogens in soy and all soy-derived products can also compromise your body’s internal ability to regulate your hormones. The Paleo diet eliminates soy and promote the consumption of meat from pastured hormone-free animals (learn why here) and organic and local produce. Consult the EWG list of fruits and vegetables that are the most and the least contaminated with pesticides to know which you should definitely buy organic and which are safer to buy non-organic. Some people on the Paleo diet may decide to include dairy, but only from pastured hormone-free ruminants. Using pyrex containers to store your food instead of plastic, avoiding water in plastic bottles and foods packaged in plastic containers as well as avoiding canned foods, especially acidic foods like tomatoes, can greatly reduce your expose to BPA. What you put on your skin also matters. Many cosmetics use ingredients that can also disrupt your hormones. Consult the Cosmetic Database to find out if your cosmetics are safe. Taking time for yourself to relax, be with people you love and play, get vitamin D from the sun, sleep a minimum of 8 to 9 hours per night, minimizing stress and thinking positive thoughts all contribute to keeping you on the right track to optimal health and fertility. It is also important that you address any health problems that could be contributing to low-grade inflammation in your body, such as digestive problems or an autoimmune condition, to help your body starts working normally again. The first step with PCOS should be to consume an amount of carbohydrates that is appropriate for you to control your blood sugar and insulin levels and the Paleo diet is a good place to start to help you find your optimal range. Avoiding hormone-disrupting compounds found in pesticides, some cosmetics and BPA and taking good care of yourself is part of the puzzles for solving your PCOS. Including fertility foods that were traditionally reserved for women of child-bearing age in many cultures around the world can also provide your body with the nutrients it needs to synthesize the right hormones in the right amounts. Try to incorporate a weekly serving or two of liver or other organ meats, fermented cod liver oil, homemade bone broth and fermented foods to maximize your health. I highly recommend PCOS Unlocked: The Manual from my very smart friend Stefani Ruper (she has PCOS too). 🙂 It’s the best resource about PCOS out there and is based on a Paleo-friendly approach. Best ebook about PCOS out there! PCOS Australia Alliance. Evidence-based guideline for the assessment and management of polycystic ovary syndrome. 2011. Grassi A. The Dietitian’s Guide to Polycystic Ovary Syndrome (PCOS). 2007. Cordain L, Eades MR and Eades MD. Hyperinsulinemic Diseases of Civilization: More Than Just Syndrome X. Comparative Biochemistry and Physiology Part A. 2003; 136: 95-112. Carrera-Bastos P, et al. The Western Diet and Lifestyle and Diseases of Civilization. Research Reports in Clinical Cardiology. 2011; 2: 15-35. Lindeberg S. Food and Western Disease: Health and Nutrition from an Evolutionary Perspective. Kandaraki E, et al. Endocrine Disruptors and Polycystic Ovary Syndrome (PCOS): Elevated Serum Levels of Bisphenol A in Women with PCOS. The Journal of Clinical Endocrinology and Metabolism. 2011; 96(3): 480-484. This entry was posted in fertility, nutrition and tagged balance hormones, fertility, gluten-free, grain-frees, hormones, nutrient-dense, Paleo, paleo diet, paleo diet pcos, paleo fertility, paleo pcos, PCOS, polycystic ovarian syndrome, sugar-free. Bookmark the permalink.